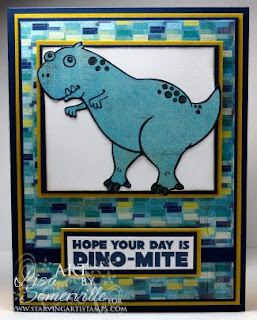 The new DoodleFactory Prehistoric images are great for kids birthdays...Here I stamped the image in Black on White card stock, cut the panel using the Out of the Box Technique, then stamped the image again on a piece of Basic Grey Lime Rickey Paper and Paper Pieced it over the original stamped image. I added a bit of Soft Suede to the Dinosaurs spots and toes. Very cute kid's card. Beautiful papers. Love that blue dino.